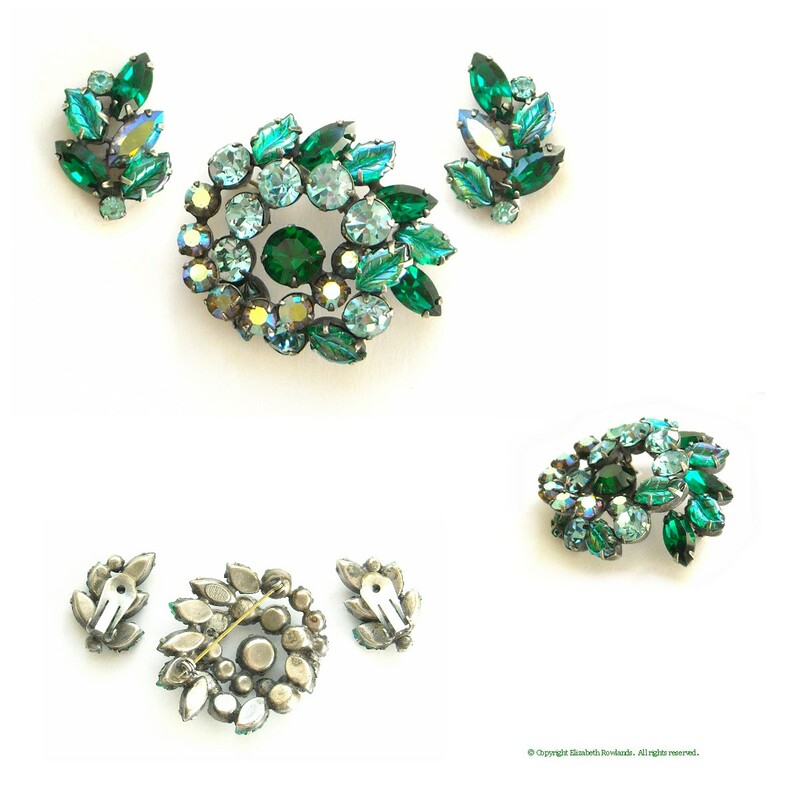 Little is known about this company, but like Weiss, the Regency name and mark is known to accompany glittering pieces with lots of rhinestones. 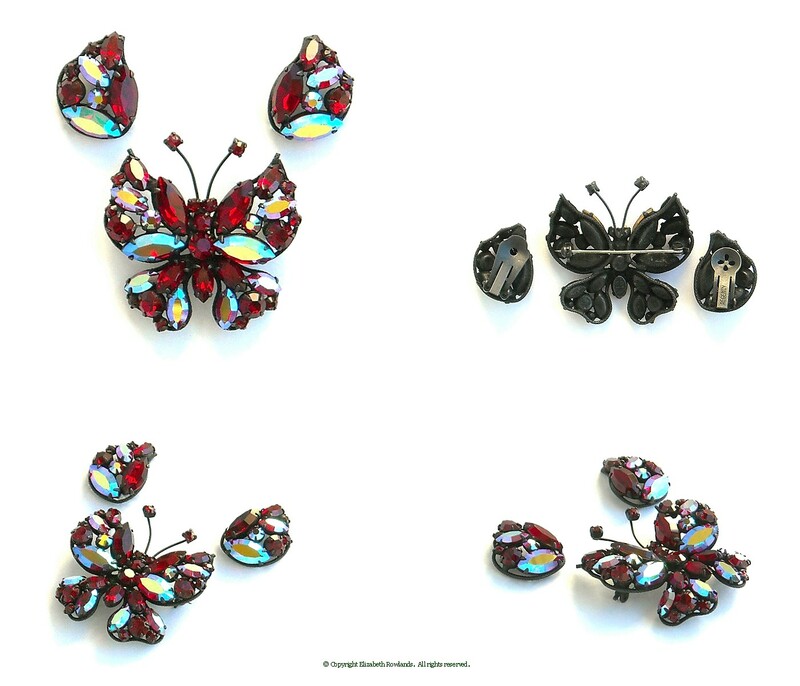 Regency butterflies are well loved, and overall the jewelry shows imaginative use of colors and unusual stones. An approximate time frame for the company is set at 1950s to early 1970s. 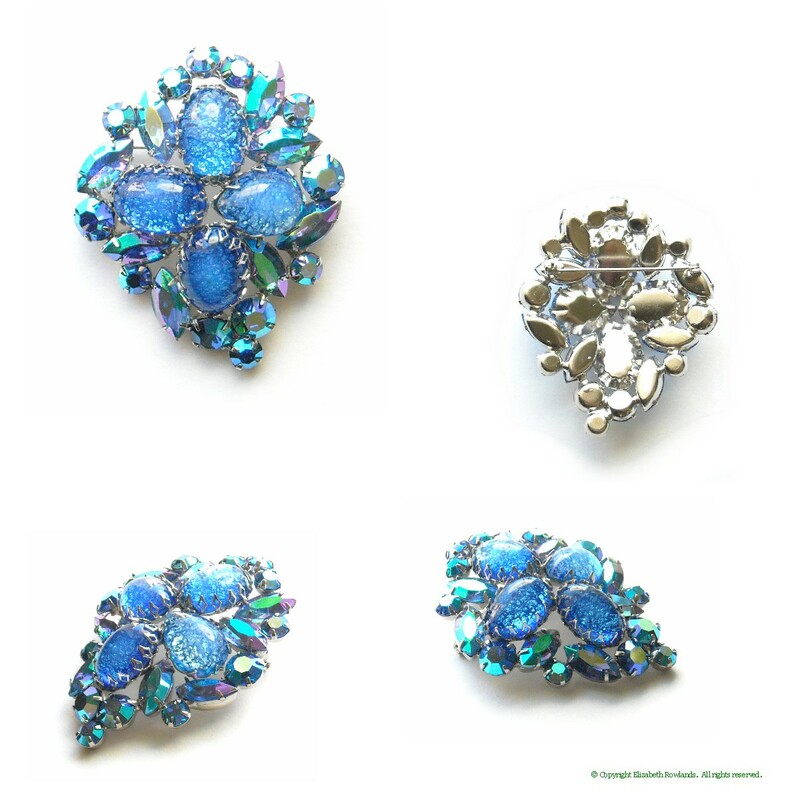 Shimmering with life and verve, this brooch is a study in blues. 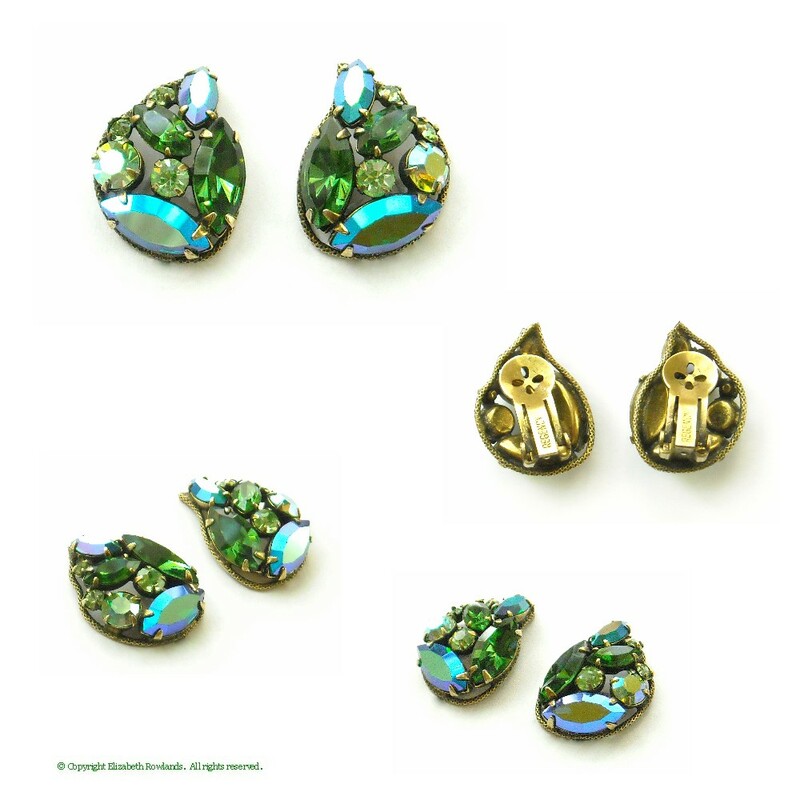 The cabochons are crackled "cat's eye" stones while the remaining stones are blue with an aurora borealis effect. The result is a slightly different look with every motion. 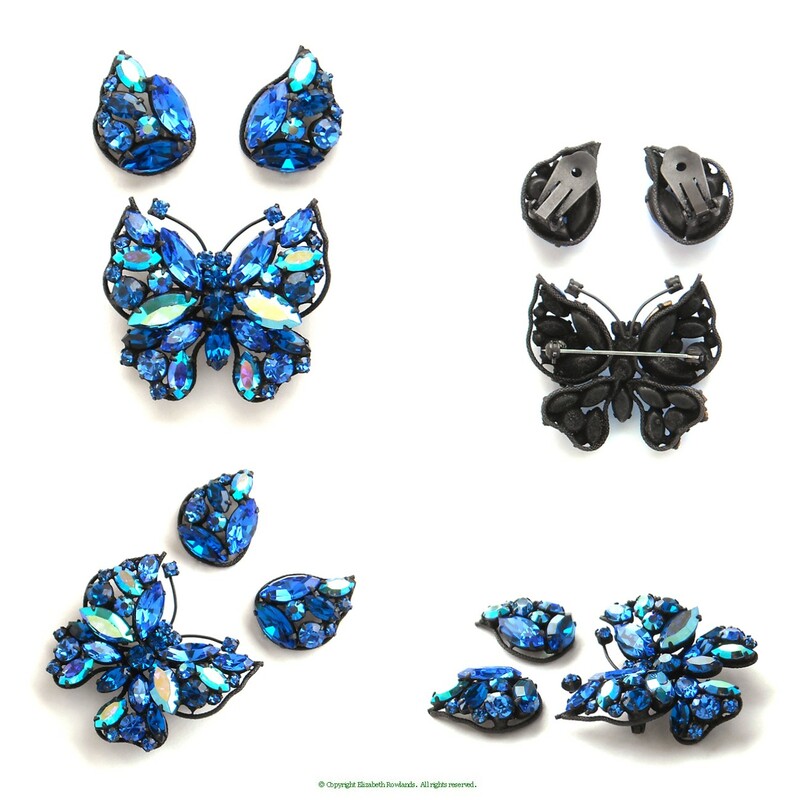 Deliciously nestled in the japanned setting, the various colored stones in this butterfly will have any butterfly collector reaching for a net. 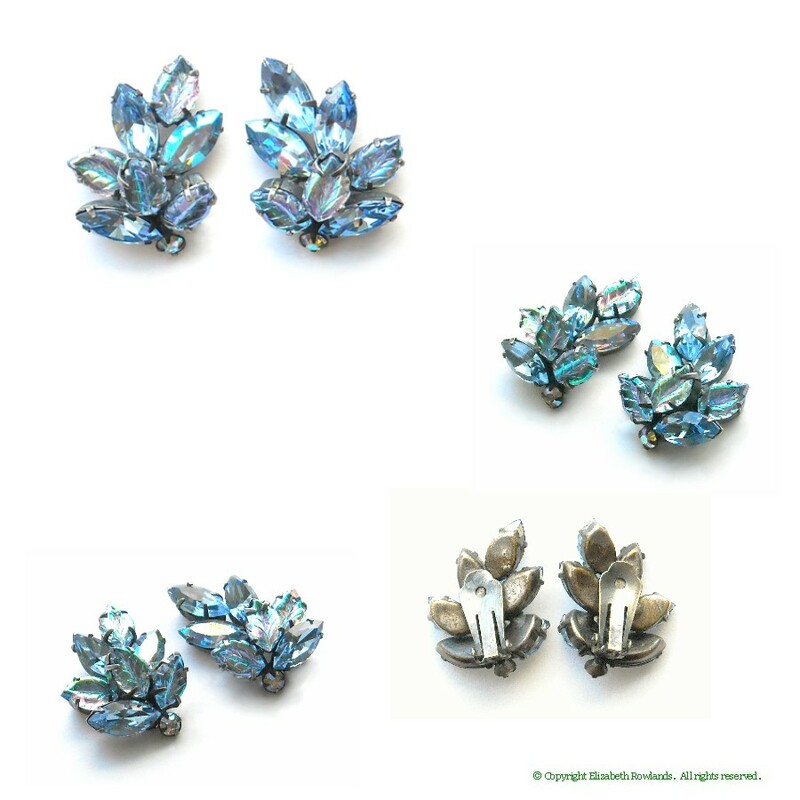 The colors include rose, olive, light blue and even blue aurora borealis stones. Unsigned, but definitely Regency. 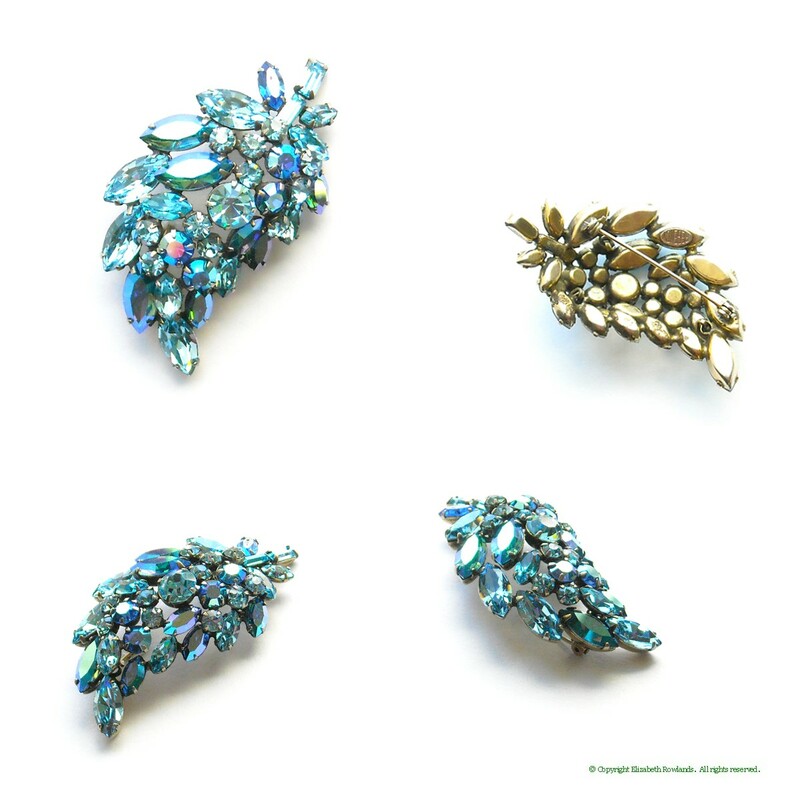 Brooch: 2 by 1¾", Earrings: 1⅜ by 1"
The japanned setting and deep blues give this stunning set a sense of drama and intrigue. 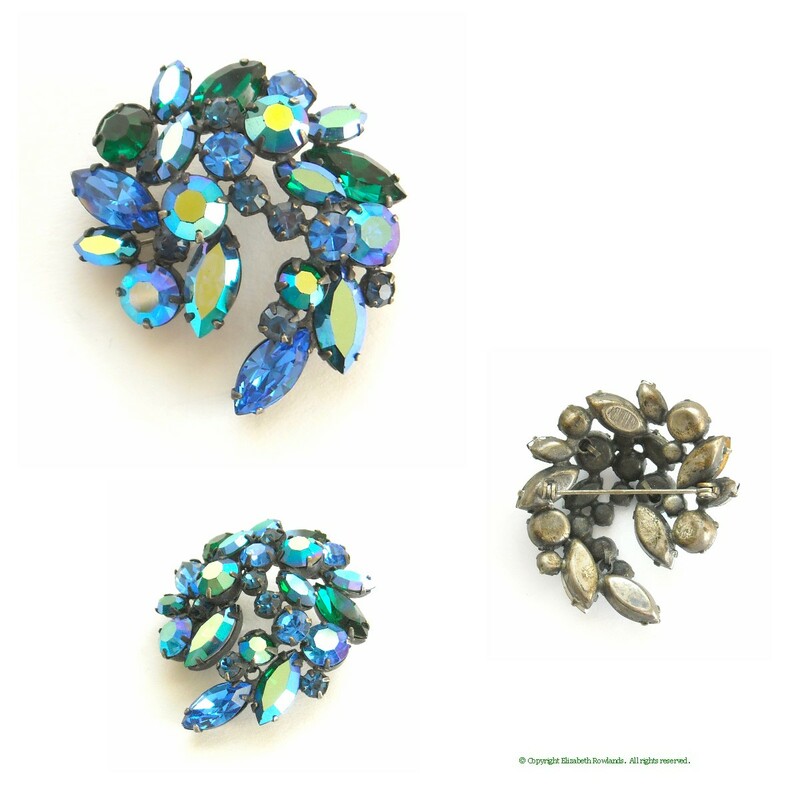 Rhinestones are various shades of blue, some with aurora borealis effects. Exceptional condition. Unsigned; see item SR279 for the signed set in red. 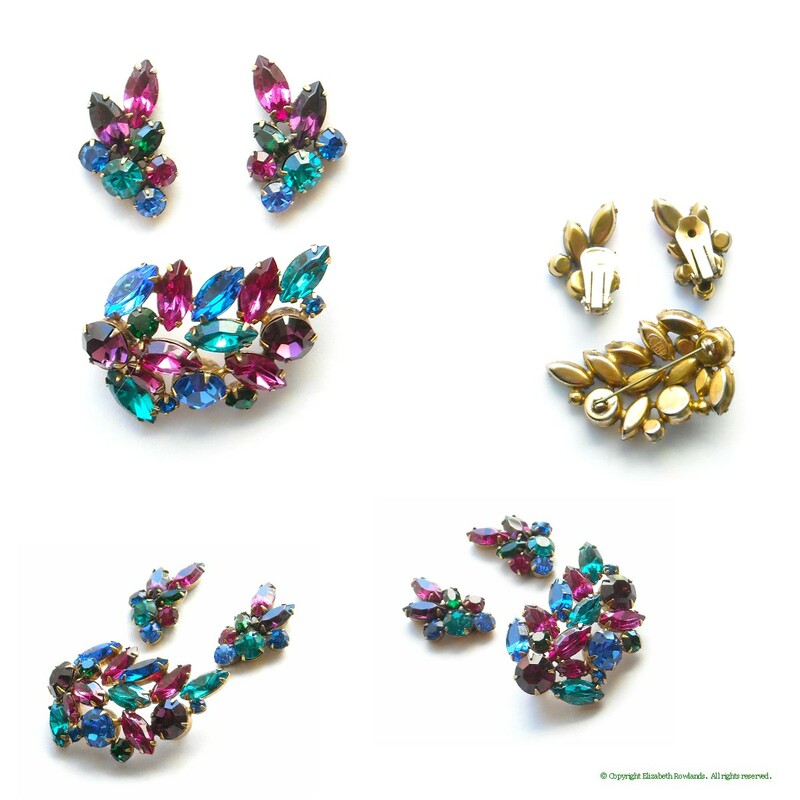 Brooch: 1¾ by 1⅝"; Earrings: 1 by ¾"
Brooch: 2 by 1⅞"; Earrings: 1 by ¾"
Brooch: 2¼ by 1½"; Earrings: 1¼ by ¾"
Warm and glowing, these clip earrings feature large pear shaped "cat's eye" cabochons with complementary rhinestones in autumn colors. Unmarked with attribution based on construction and similar marked pieces. 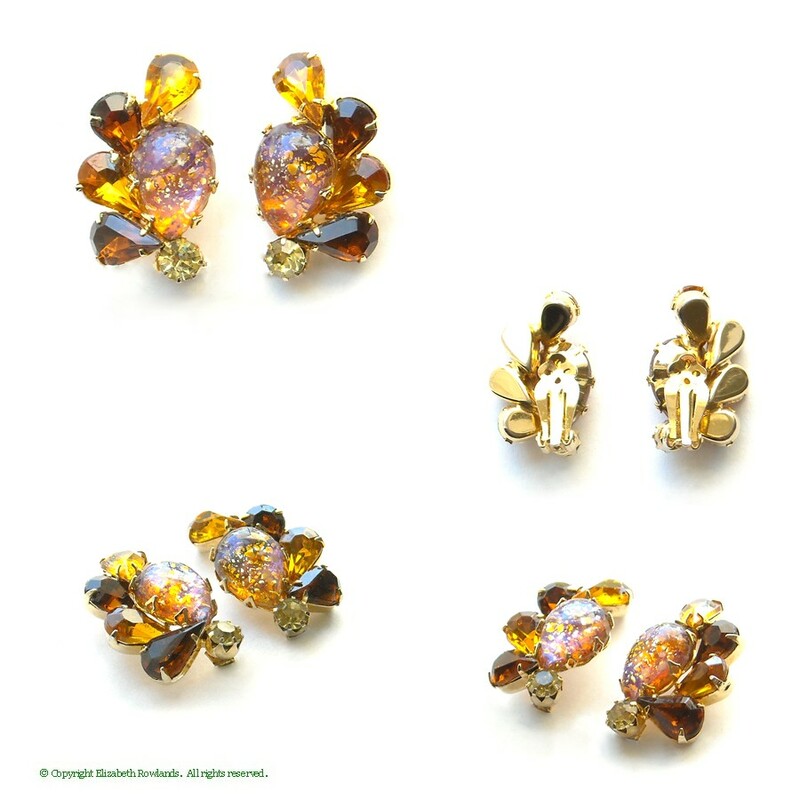 Goldtone setting; exceptional condition. 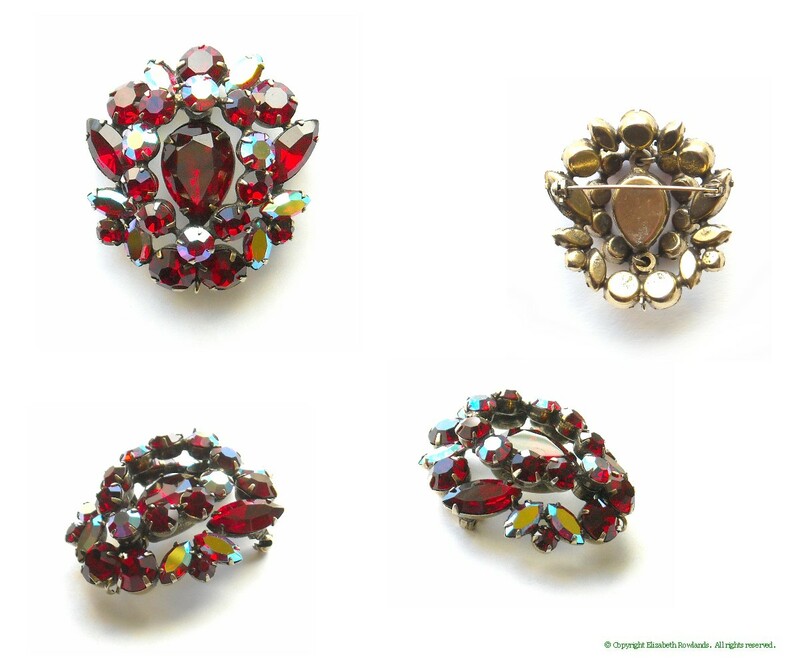 Deep red and aurora borealis stones give this layered brooch incredible pizzazz. The large red pear shaped stone is nestled in the layers, drawing the eye inward. 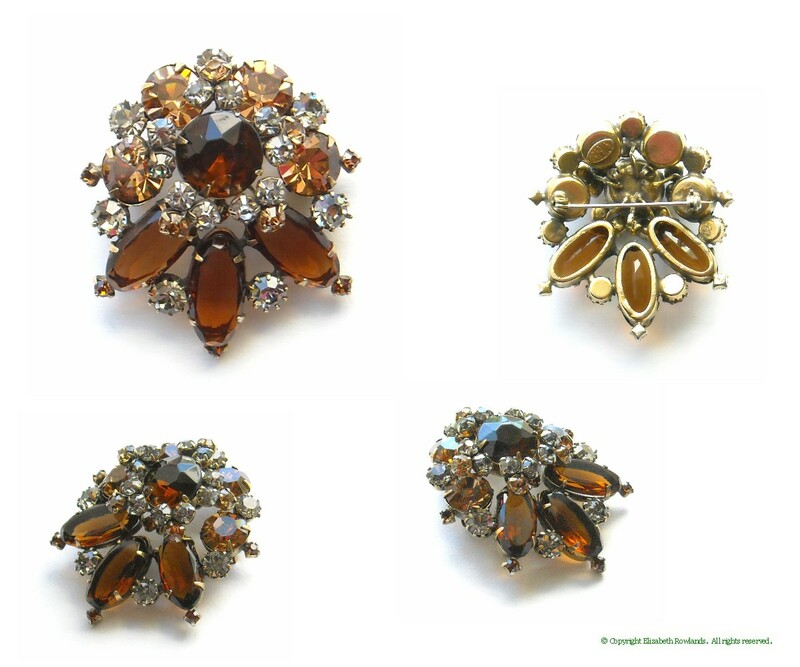 Unsigned, but of the typical construction and style of Regency pieces. 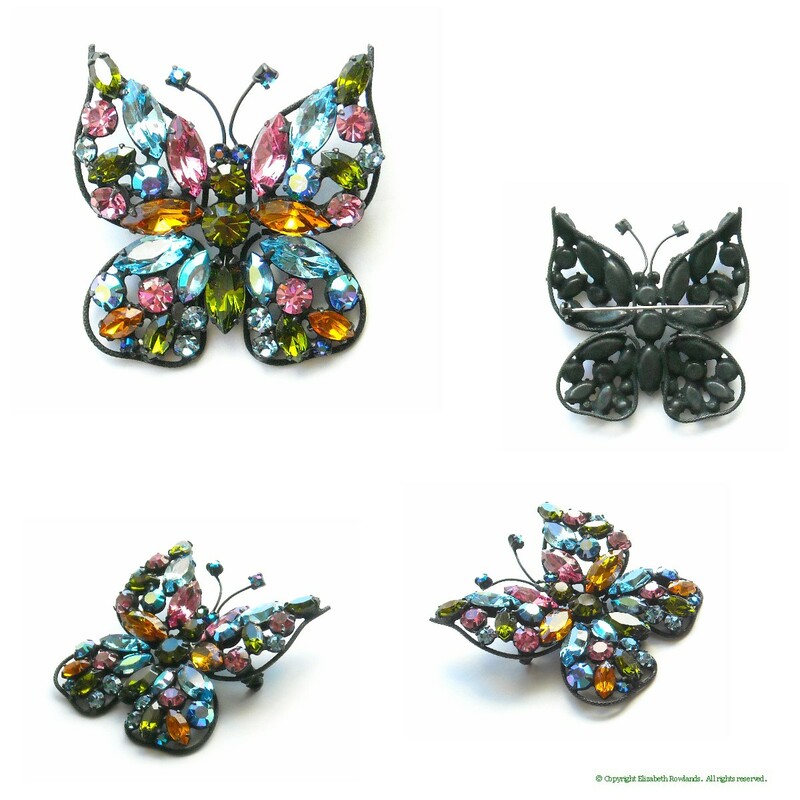 Brooch: 2 by 1¾"; Earrings: 1 by ½"